All transactions are safe and secure with a reliable history in online purchasing behind each of our associates. 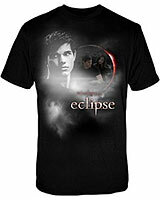 Buy the Eclipse Jacob Black t-shirt to own Eclipse clothing and merchandise. If you prefer someone a little warmer who can sleep at your feet through the night, then this Eclipse Jacob Black shirt is what you have been hunting for. Not only can this very hot werewolf jump, snarl and run, he is also loyal, protective and eager, especially around his wolf pack. Jacob has even proven that when push comes to shove he can put all grievances aside to help protect his land from Victoria's Army. Don't forget to check out the Eclipse Newborn shirt even if Jacob is the love of your life. In addition to the Eclipse Jacob Black tee above, browse the Eclipse Clothing Gallery for more apparel like men's and women's clothes, kids shirts or hoodies.